The trip started in Paris, where we find them first playing tourist, getting reacquainted as it were. 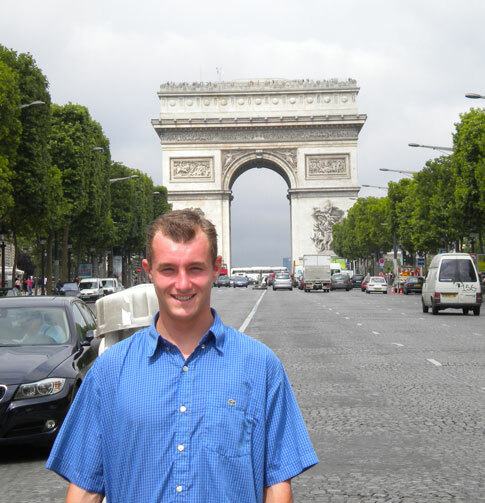 Here is Alban on the Champs Elysées, looking west toward the Arc de Triomphe. 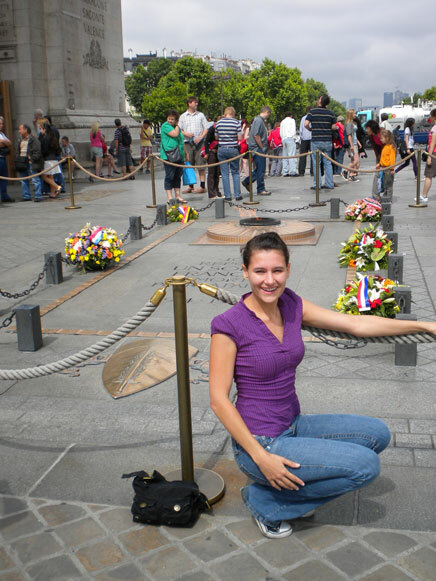 And here is Daphné at the Arc de Triomphe, in front of the grave of France's unknown soldier. Daphné also took advantage of the opportunity to take a journey through her past. 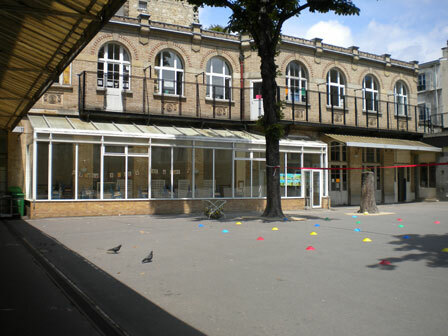 She was just seven years old when she and Alban left Paris: this was their old school in the 17th arrondissement. Reflecting the current obsession with security in schools, she was asked to leave shortly after taking this photo. 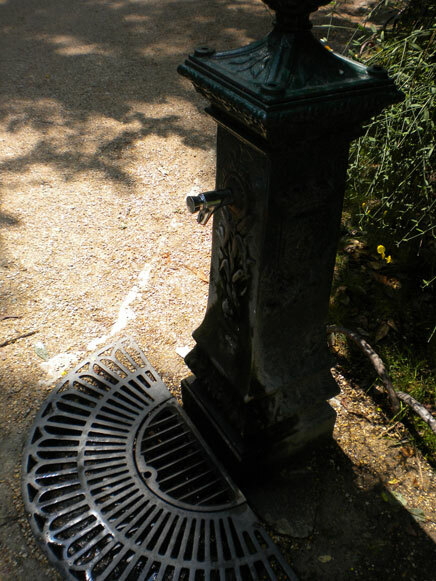 Just around the corner, she liked the look of this fountain in the Square des Batignolles, where the family liked to stroll in the afternoons. Her mother jumped when she saw the picture back in Santa Cruz: "that's where I lost my keys when I was a little girl!" Mother-daughter communication. Mostly, they were in France to visit family, and in particular their dad. Here he is, Pierre Brun, with Alban and his French little sister Lou on a promenade on the Mediterranean shore. 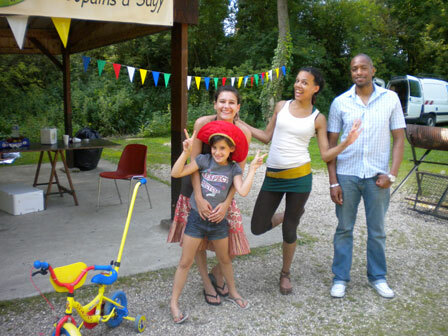 Here is Lou again (her shirt says "respect, recycle"), this time with Daphné, older sister Severine and her beau Gareth. At last, a Brit! Gareth, that is. 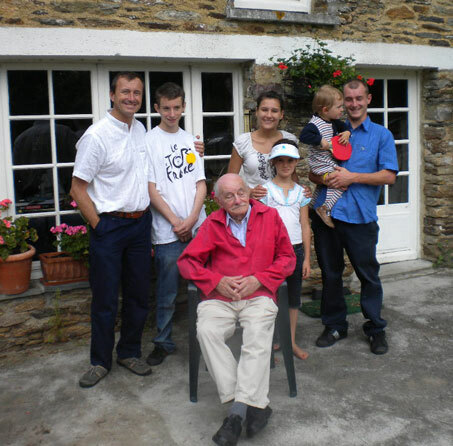 They also found the time to spend a few days with their grandfather at La Grée. 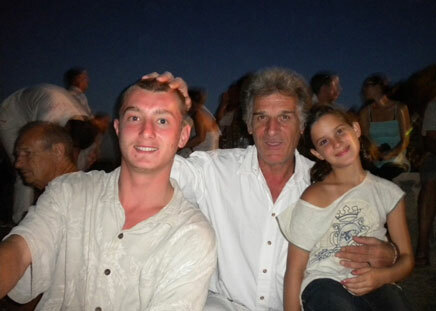 Lou came too (in front of Daphné), and Oncle Denis stopped by with his sons Bertil and Clément (in Alban's arms). Of course, they also found time to fool around, this time dancing on the lawn at La Grée in front of the camera on a timer. Daphné found the time at La Grée to experiment with the photographer's art, which made particular sense there because her grandfather is a retired photographer. 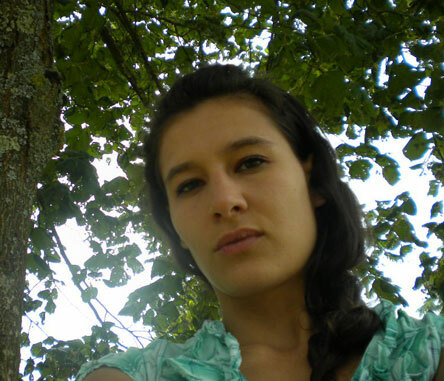 She took this one with the timer exploring sun through the leaves as a background. On the right, Alban partying with the barbecue at La Grée. 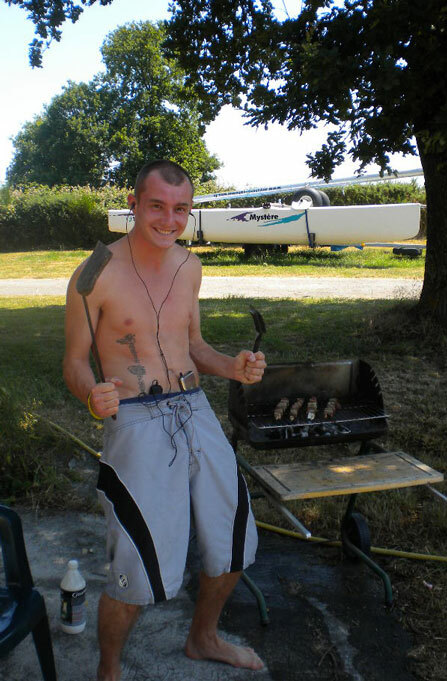 That tattoo brought on a serious disagreement with his mother! The sailboat behind him is his Oncle Denis's, on the way to the Atlantic for his summer vacation. On to a week camping en Provence, with Pierre and Lou. 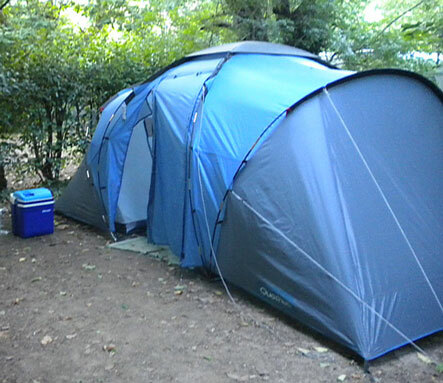 Here is the family tent. 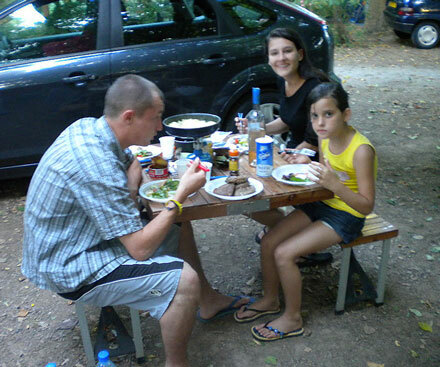 . . .
. . . and here a meal at the campsite. 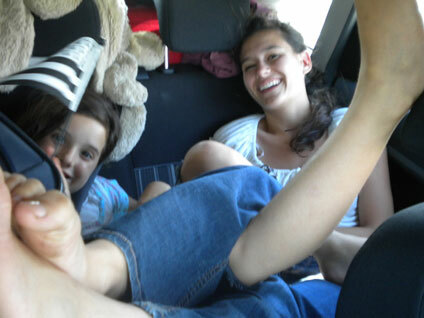 Lou and Daphné are sprawled over the rear seat of their dad's rental car, with luggage and camping gear all around them, on the way to or from the camp site in the South of France. Back in Paris, Alban looked up Tom, whom he had not seen for eighteen months, since Tom left Santa Cruz to move to Paris. 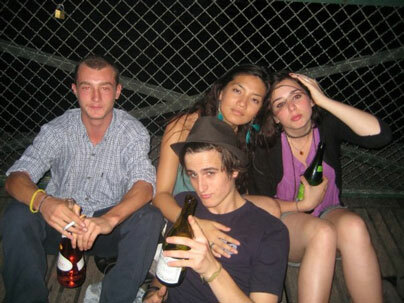 He found him with his then girlfriend, Maureen, and spent a couple of days with them and their friends. This photo, found on Facebook, suggests that they were all entertaining themselves as young people do! Daphné also found time to photograph a few of the cultural treasures that she ran across. 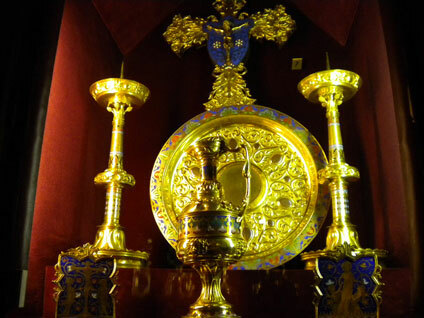 Here is a collection of gold ornaments from the Cathedral of Notre Dame de Paris. 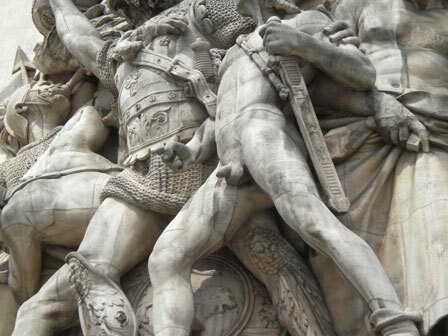 . .
. . . . and here is some of the decoration on the Arc de Triomphe. She always has had an eye for detail.